Under the leadership of Dr. Carl Garnett, Trinity Baptist Church was founded on April 12, 1992. The church first met at Betty's Cafeteria and then moved to the theatre building in Bainbridge. After holding services there for a while, the church acquired some property on which we built a sanctuary and fellowship hall. Later on, when WalMart purchased that property from the church, TBC acquired a 50 acre parcel of land to which we relocated the sanctuary and fellowship hall. Since moving to this new location at 1865 Tallahassee Hwy, we've also been able to add on a wing of offices and classrooms, as well as an elegant foyer and a building that houses our Bible Seed Ministry. In 2003 our people met together for a special Sunday Evening service. That evening, those present had a special time of prayer and earnestly asked God to bless Trinity Baptist Church and make her a lighthouse throughout their community and around the world. 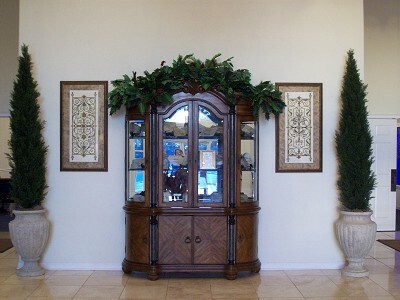 In following with the example of the children of Israel when they entered the Promised Land, each person in that special service signed a stone. These stones are displayed in our foyer as a memorial to generations to come of Trinity's rich Biblical heritage. Trinity has been tremendously blessed over the years. 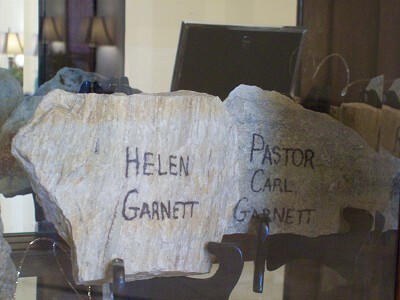 After nearly 20 years as Pastor at Trinity Baptist Church, Dr. Carl Garnett and his wife Helen retired in December 2011. Their dedication to Trinity Baptist Church and the Bainbridge community has had a powerful impact on many. In January 2012, Brett Ellinburg became Pastor at Trinity. He and his wife Catherine are natives of South Georgia, and along with the church, are excited about the great things God is doing at Trinity Baptist Church.